The Stables in Holmesfield, near Dronfield, Derbyshire sleeps 4 people. 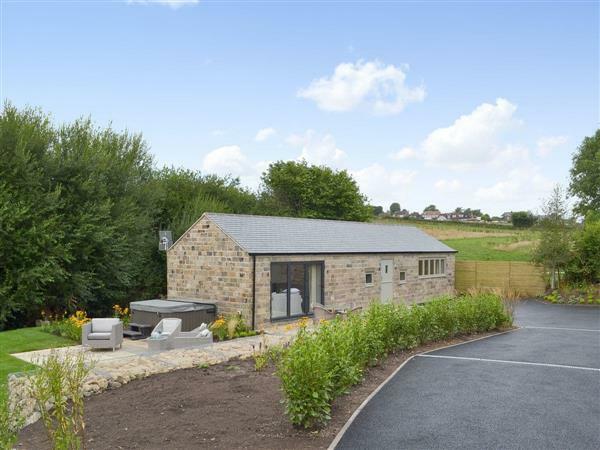 The Stables near Dronfield sits on the edge of the Peak District National Park, with breathtaking views overlooking the Cordwell Valley. Every detail has been thought of when converting this fabulous former stables with a full range of modern amenities. The two spacious bedrooms with vaulted ceilings are welcoming and spacious with interior design to enhance the rustic feel. Walk into the light and airy open plan living space, perfect for your party to relax and enjoy, with bi-fold doors opening up onto a landscaped area with a fantastic hot tub. Leading onto footpaths through stunning countryside you may even be able to spot the wild deer in the Cordwell Valley. Surrounded by rolling farmland and countryside views, this really is the ideal place to unwind. The city of Sheffield and the famous crooked spire town of Chesterfield can both be reached within 20 minutes, as can many other fantastic tourist destinations. Bakewell, Tideswell and Castleton are nearby, all boasting cafés, craft shops and quaint village shops. Why not visit the Chatsworth Estate and Hardwick or Haddon Hall, just a small sample of the many attractions close to this wonderful cottage? The shop is 1 mile from The Stables near Dronfield, with the pub and restaurant ½ mile from The Stables. Stone floors in most rooms. Open plan living space: With bi-fold doors leading to garden. Living area: With Freesat TV, MP3 connection and Bluetooth speaker. Bedroom 1: With zip and link super king-size bed (can be twin beds on request). Bedroom 2: With zip and link king-size bed (can be 2ft 6in twin beds on request). Oil underfloor central heating, electricity, bed linen, towels and Wi-Fi included. Welcome pack. Lawned courtyard with patio and garden furniture. Hot tub (private). Private parking for 2 cars. No smoking. Holidays at The Stables run from Friday to Friday. For a better idea of where The Stables is, you can see The Stables on the map below. The Stables is in Derbyshire; should you be on the lookout for a special offer, you can find all the special offers in Derbyshire. It's always worth checking to see what is on offer at the moment. Do you want to holiday near The Stables (UK4142), you can see other cottages within 25 miles of The Stables; have a look to find your perfect holiday location.